Tra-la-la. 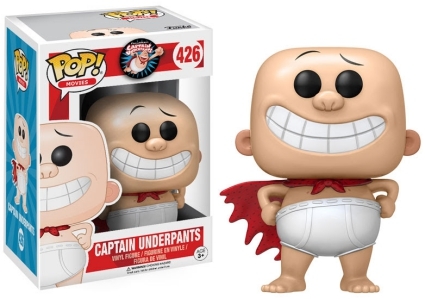 Hold onto your tighty whities because Funko Pop Captain Underpants joins the Pop! Movies line. Most people remember Captain Underpants as an over-the-top, goofy book series first published in 1997. However, DreamWorks is adapting the controversial superhero into a feature film—Captain Underpants: The First Epic Movie—which maintains the original storyline. Two fourth grade besties—George Beard (Kevin Hart) and Harold Hutchins (Thomas Middleditch)—hypnotize their evil principal Mr. Krupp, voiced by Ed Helms, thus converting him into their own comic book hero. Shop for Captain Underpants Book Collections on Amazon. 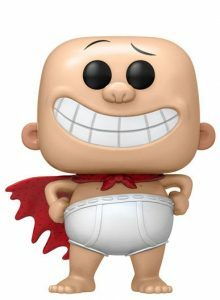 The initial lineup for Funko Pop Captain Underpants includes the new and improved Principal Krupp as Captain Underpants, wearing only white underwear briefs and a red cape. Also notable on his rather large head is a huge grin and rounded ears with a pink coloring. 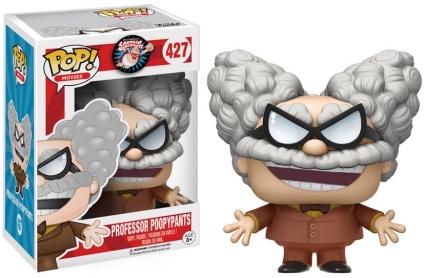 On the other hand, Professor Poopypants is fully clothed. Dressed in a brown suit and bowtie, his curly gray hair resembles Einstein’s wild hairdo and mustache. 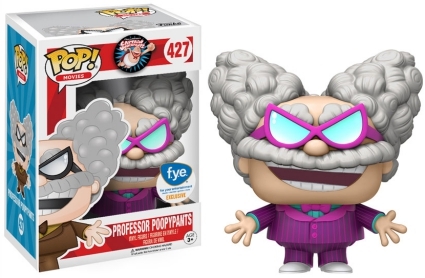 In addition to the main option, the FYE exclusive features Professor Poopypants decked out in a pink suit. Numbered as part of the Pop! 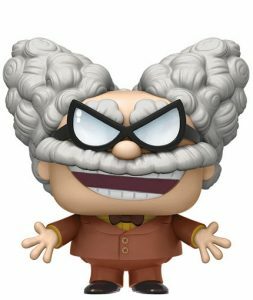 Movies line, Funko Pop Captain Underpants figures appear slightly larger than the standard 3 3/4” Pop! size.